For more than a decade, 10 October has been the World Day Against the Death Penalty. It is an important activity of the global movement against capital punishment. Amnesty International has been campaigning on the issue since the 1970s. But since the beginning of the century, the movement has grown. There have been regular world congresses of abolitionists. A prestigious commission of international personalities intervenes regularly through statements and declarations. In 2007, the United Nations General Assembly adopted a resolution calling for a global moratorium on executions. Since then, similar resolutions have been adopted at two-year intervals, with increased majorities each time. Almost forty years ago, in his first periodic reports on the death penalty, the United Nations Secretary-General said it was not possible to identify trends with respect to capital punishment. At the time, a very substantial majority of states imposed the death penalty. Less than ten had done away with capital punishment completely. So as to boost the numbers of abolitionist states, the Secretary-General included those that no longer executed for ‘ordinary crimes’, recognising the fact that many countries insisted on retaining the practice in wartime and emergency situations. 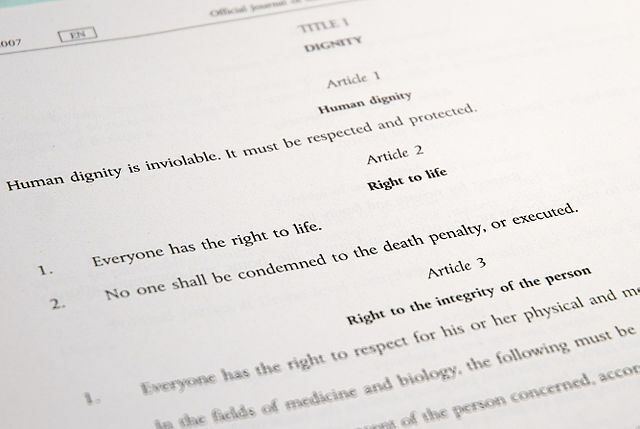 Even the Council of Europe, in 1983, had to satisfy itself with a protocol to the European Convention on Human Rights that proclaimed abolition of capital punishment but only in peacetime. Article 2 of the Charter of Fundamental Rights of the European Union. CC-BY-SA. Photo by Trounce/Wikimedia Commons. How things have changed. Even those states that still retain the death penalty would not dare to deny that they are bucking a powerful global trend. Indeed, since about 1980, an average of three countries every single year has joined the abolitionist camp. From fewer than 30 abolitionist states in 1973, the number now exceeds 150. Many states abolish capital punishment through legislative reform, sometimes even accompanied by constitutional amendment. But a significant number simply stop carrying out executions either quietly or through an officially-proclaimed moratorium. When they go ten years without a hanging, the United Nations deems them to be abolitionist in practice. The 2009 report of the Secretary-General showed that this is methodologically very solid as a measure of abolitionist commitment. States that have not executed convicts for a decade almost never return to the practice. The same can be said of abolition in law, which has only been reversed once in recent decades in the Philippines, and then only temporarily. Abolition is essentially a one-way street. The perhaps inevitable focus on tallies of countries that are abolitionist or retentionist only provides a partial insight into the dynamics of this process. Just as significant is the fact that most states in the increasingly small category of those that continue to execute actually do so less and less. Of the forty-odd death penalty countries that still remain, only about twenty conduct an execution in any given year. The United States and China are among the small group that conduct executions every year. Both of these countries have seen the number of persons executed each year drop to about one-third of the number only a decade ago. Whether measurements focus on the number of abolitionist states or the number of executions in retentionist states, the statistics tell the same story. Not only does the trend continue unabated, it actually seems to be accelerating. Several regions of the world are now essentially free of capital punishment. In recent years, the only executions in the western hemisphere have been conducted in the United States, mostly in former slave states with justice systems that still reflect their brutal and racist ancestry. Belarus is the only European nation to carry out executions but it conducts barely two or three each year. Only a few African states, essentially concentrated in the northeast corner of the continent, regularly execute people. None of the states of the ‘Arab spring’ — Egypt, Libya and Tunisia — reports an execution since 2011, according to Amnesty International’s annual booklet on the subject. Thus, the death penalty is today mainly an Asian phenomenon. But Asia is far from homogeneous. Much of Southeast and Southern Asia, including Cambodia, Myanmar, the Philippines, Thailand, Nepal and Sri Lanka, has stopped executions. India, Pakistan and Bangladesh have a very small number of executions. In China, the numbers are still appallingly huge, but they are surely declining at a rapid rate. Chinese scholars and legal practitioners insist that the country’s goal is abolition. The darkest spots on the Asian continent are Iran, Iraq, Saudi Arabia and a few of their smaller neighbours. They remain profoundly attached to capital punishment, offering unconvincing references to scripture as a justification. But in those countries, capital punishment is mainly used for drug traffickers, a matter on which the religious texts do not take a position. Capital punishment continues not because the political leaders are pious and devout but rather because they are autocratic and repressive. In his influential book The Better Angels of our Nature, Stephen Pinker situates the decline in the use of capital punishment within the broader theme of a general reduction of institutionalized violence. Pinker’s compelling thesis is that the world is increasingly less violent, as trends in everything from judicial punishment to armed conflict and ordinary crime demonstrate. His argument provokes another observation. The abolition of capital punishment has been central to the modern human rights movement. Simple statistics tell us that there is a great deal less capital punishment than in the past. The human rights movement is entitled to some of the credit for this. Unlike many other issues, such as racial or gender discrimination or the practice of torture, capital punishment easily lends itself to quantitative analysis. But is this also a useful metric that signals a broader and more general trend to improvement in human rights? The declining numbers of executions in the modern world are thus an indicator of profound improvements in other areas too, whose measurement is less straightforward. In other words, 10 October is an important date for more reasons than one. William Schabas is Professor of international law at Middlesex University in London and Professor of international criminal law and human rights at Leiden University. He is the author of the major academic study on the death penalty and international law. In 2009, Professor Schabas prepared the United Nations Secretary-General’s five-year report on capital punishment. His latest book with Oxford University Press is entitled Unimaginable Atrocities.